When the Sun turned 600 million years and it has already started to gather around him the heavenly bodies, large planets of hydrogen and helium, such as Jupiter, Saturn, Uranus and Neptune were moving more chaotic. At that time, their orbits are not yet established, so they've shut myself off from the cosmic body of a smaller size. Some of them flew outside the system, in the Kuiper belt, and some of them hit the other, which were closer to the Sun and consisted of iron and silicates. However, during this chaotic collision orbit of Jupiter was gradually changed, giving more inertial motion of the inner planets - Venus, Earth and Mars. Sooner or later, it would completely destroy the Solar system. But something prevented the Land from dispersal crash into Mars or Venus. 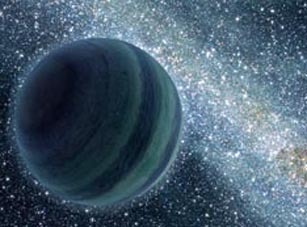 Nesvorny with colleagues proposed a theory "jumping Jupiter". Its essence is that this planet dramatically changed its orbit, rebounding from Uranus or Neptune, when passed by them, and took place in the system we know. So Jupiter has ceased to affect the orbits of the inner planets and tell them too much momentum. This has saved the Earth from the catastrophic end of the 4 billion years ago. But the story does not end. Such a movement must be shove Neptune beyond the Solar system. And it is in place. American scientists have conducted more than 800 computer calculations and created 40 different models to figure out why when "jumping Jupiter" all were in their places. And here is a recent experiment clarified the situation. According to mathematical calculations, planets once was nine. Beyond Neptune there was another gas giant education. Jupiter pushed ninth planet beyond the Solar system, and it took on its present appearance. "This is like a multi-game, for example, in chess. As a result of such movements was saved the Earth, where he created conditions for the emergence of life. In chess, to save the Queen, you sacrifice a pawn" - said Nesvorny. You are reading news Девятая планета спасла Землю if You liked the article Девятая планета спасла Землю, prokomentiruet her.